Authority humans give us orders, pass laws, make decisions for us and sometimes exert physical and/or mental force on us in the form of violence, threats of violence and/or demands. 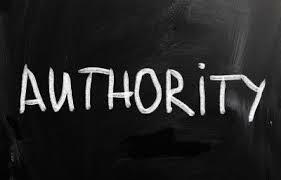 If we feel that the authority is just then we tend to obey but if authority is unjust then we may choose to disobey or even revolt against the authority in overt and/or covert ways. Older offspring, parents, teachers, coaches, organization leaders, scientists, and politicians are authority humans and we may like or love them if they are just or seem just or disapprove of or even hate them if they are or seem unjust. Emotions play a dominant role in our attitude towards authorities and if they are honest, sincere, dependable, competent, and trustworthy then we generally respect and even admire them and have a tendency to obey them or take their advice with relatively little resistance. If the authority human is unjust or dishonest, insincere, not dependable, untrustworthy, and incompetent then we have a tendency to disobey or ignore them and not take their advice or demands on important matters in our life. The lead are expected to have moral behavior but leaders, especially at the top, frequently feel that morality does not apply to them and they can be unjust with humans and other nations and get away with it. For leaders sometimes the end justifies the means and they will murder, lie, deceive, steal, and commit adultery if their goals of more powerh and money are achieved. True world peace will only come when the leaders obey the morality which is expected from the led. Two or more immoral nations will never be able to reach mutually beneficial relationships and peace between them if they act immorally towards each other. For all nations to live in peace with one another they must have the same secular moral code. Except in emergencies-don’t destroy biodiversity, don’t lie, don’t be inefficient, don’t steal, don’t commit adultery if married, and don’t murder. Big money is trying to rule the world but Putin just stole the Crimea with physical force and China is stealing intellectual property. Yes, big money is the enemy of little money and has a powerhful advantage and the ability to exploit and/or enslave little money so even free trade is not the ultimate solution to justice in this world. Big money is more powerhful than little money. Free trade must be coupled with moral behavior between nations and moral behavior within a nation. It is obvious that the world must have just international laws and nations must have just national laws which are mirror images of just international laws. There is authority over real estate and the right to change it in legal manners. Wilderness real estate is the most precious and vital to future generation survival so authority must be given to conserve and even expand it in its pristine existence. There is also authority over information and/or goods and/or services and this powerh should be used wisely and justly and not greatly impede the efficiency of its just distribution to the humans of the world. I advocate those new just laws in my evergreen truth books NEW UNIVERSAL DECLARATION OF HUMAN RIGHTS, NEW CONSTITUTION OF THE UNITED STATES, CHANGES IN WELFARE LAWS, and JUSTICE. This entry was posted in common sense, education, globalism, justice, money, science, society and tagged authority, commands, common sense, demands, education, globalism, justice, money, obedience, science, society, the truth about authority on May 5, 2014 by uldissprogis.